5-million acres of prairie soils are deficient in potassium. These tend to be concentrated in east central Alberta and the northern agricultural regions of Saskatchewan and Manitoba. Potassium-deficient soils tend to be light to medium textured, alkaline, carbonated and poorly drained in their natural state. Organic soils are also frequently deficient in potassium. Let’s look at the three laws I proposed in the first part of this series. The Law of Diminishing Returns – This law can be illustrated with the following data from a malt barley study done by Westco in 1987. 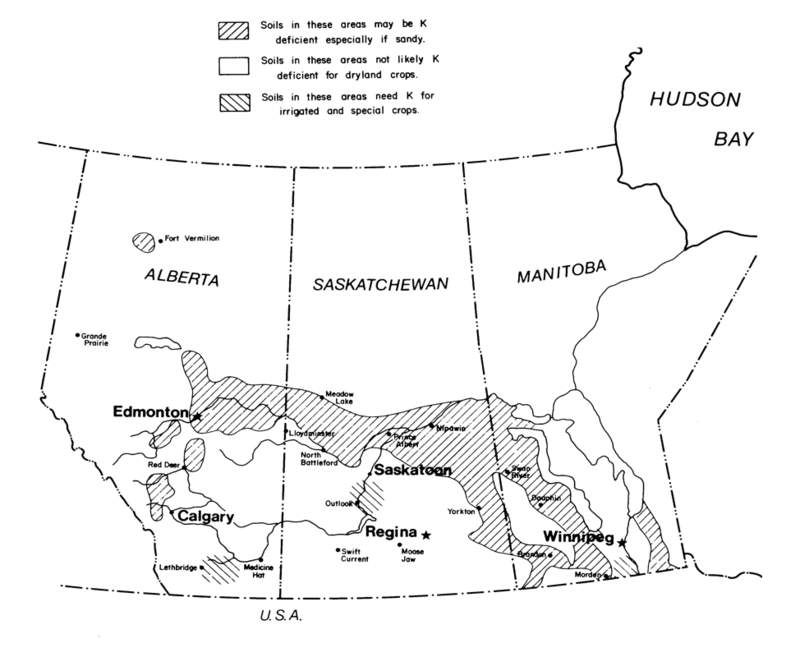 The study was carried out at four locations in Alberta. Four rates of potassium (K20) were applied with the Nitrogen rate being held constant at 54 lbs / acre. The Law of Diminishing Returns is also illustrated by looking at the results above. On to the 4R’s of Potassium Management. The first R is The Right Source. Unlike Phosphate, there are relatively few potash sources. Murate of Potash (0-0-60 or 0-0-62) KCl – This is the product that is mined at many facilities across Saskatchewan and shipped abroad for use as a fertilizer. Not only is it an excellent source of K – the symbol used to represent Potassium or Potash, it contains chloride (Cl) which is also a nutrient required by plants. KCl is very flexible for application. It can be broadcast, banded or seedplaced. However, when seed-placing, one must remember that this product has a high salt index and can be toxic to some seeds. When using it, the effect with a product like MAP is additive – meaning that the effect of both products is equal to that of either product being used at the combined rate. Murate of Potash (0-0-62) can also be dissolved in water and applied as a liquid. Sulphate of potash-magnesia (0-0-22-10.5Mg-22S) K2SO4•2MgSO4 is mined from deposits in New Mexico and is commonly referred to as K-Mag or Sul-Po-Mag. Potassium-magnesium sulphate has a higher cost per unit of K than the muriate form. It also contains 10.5% magnesium and 22% sulphur in water-soluble form and therefore readily available to plants. It is useful as a source of soluble magnesium in fields where lime is not required. Sulphate of Potash (0-0-50-17S) • K2SO4 is considered a premium-quality potash. It contains two key nutrients for growing crops: potassium and Sulphur. It has a lower salt index and is more expensive than Murate of Potash. It is used mainly on crops sensitive to chloride, such as tobacco, potatoes and some vegetable crops. Again, let’s now look at the Right Rate. Like phosphate, the Right Rate is going to depend on three factors. Factor number one is the crop that is being grown. Potash is concentrated in the leaves of plants so plants that produce a lot of foliage compared to seeds are going to use more potash. This would include grasses and legumes grown for forage. Of our grain crops, barley has shown to be most responsive to potash, followed by wheat. Broadleaf crops such as canola, flax and peas are not responsive to potash. Canary seed and certain varieties of winter wheat have shown to respond to the chloride component of KCl. There are a lot of growers that apply 15 lbs K2O with several crops. This practice is an artifact from a number of years ago when a few studies indicated 25 – 30 lbs of seedplaced K2O occasionally showed a yield response. The recommendations were to apply 0 or 30 lbs with the seed. When automation took over in the printing of recommendations, the recommendation became an average of 0 and 30 or 15 lbs for all cereal recommendations. There weren’t any studies that showed 15 lbs K2O applied in the seedrow gave a response! The Right Rate is going to depend on the soil test. As stated above, there are soils that may be deficient in potassium. 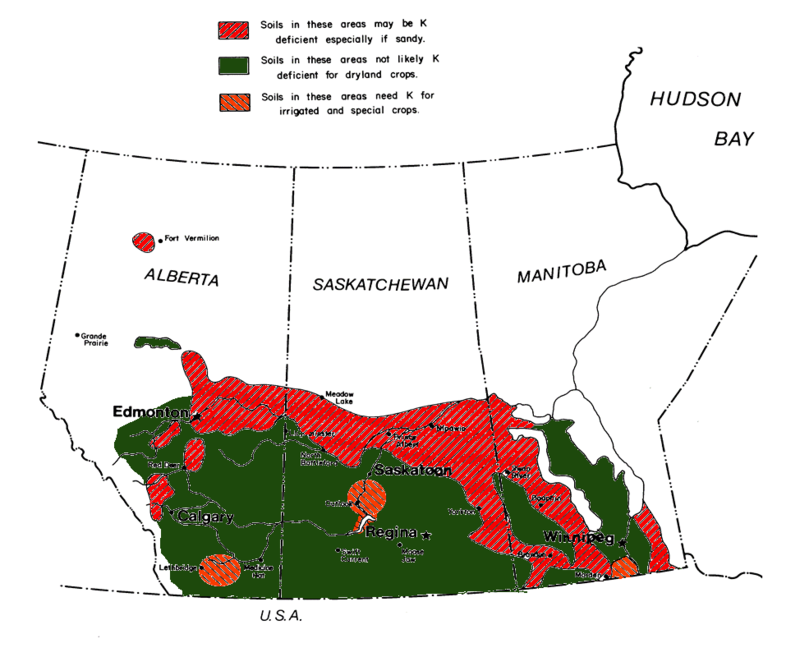 However, most of western Canada has inherently high levels of potassium – those being above 125 ppm or over 250 lbs/acre. In these soils we can apply 25 – 30 lbs in the seedrow to provide potassium to young plants when the soils are cold and wet. However, the chances of getting economic payback is low – approximately 30% for barley and less for wheat and oats. There is very little chance of an economic response in pulses or oilseeds in high potassium soils. As well, seedrow potassium is about as toxic to germinating seeds so any additional K will have to be subtracted from the amount of P you seed-place. If you follow a crop removal philosophy when dealing with potassium, forage crops are probably the crops with the highest demand. In these crops, we are looking at 50 lbs removal for every ton of hay. Over the past few years, some agronomists and agronomy organizations have been using the base-cation saturation ratio or BCSR approach to develop fertilizer recommendations from a soil analysis. This concept was developed by soil scientist Dr. F. E. Bear and his co-workers and introduced in papers published in 1945 and 1948 based on a greenhouse experiment in New Jersey. They suggested that in the ideal soil Ca, Mg, K and H should occupy 65, 10, five and 20 per cent of the cation exchange capacity and that the ideal ratio between Calcium (Ca) and Potassium (K) should be 13:1 and with Magnesium (Mg) and Potassium (K) be 2:1. For the past three decades researchers have invested considerable field research dollars and effort in studying and comparing the BCSR to the sufficiency level approach to making fertilizer and more specifically potassium recommendations (more on this in a future column). To date, it has not shown to be an effective way of predicting potassium recommendations in the Northern Great Plains. Dr. Johnson and Dr. Karamanos wrote a newsletter in 2015 that discusses BCSR and its use in the Norther Great Plains and Canadian Prairies. You can read it here. The International Plant Nutrition Institute (IPNI) analyzes soil test results across North America every five years. 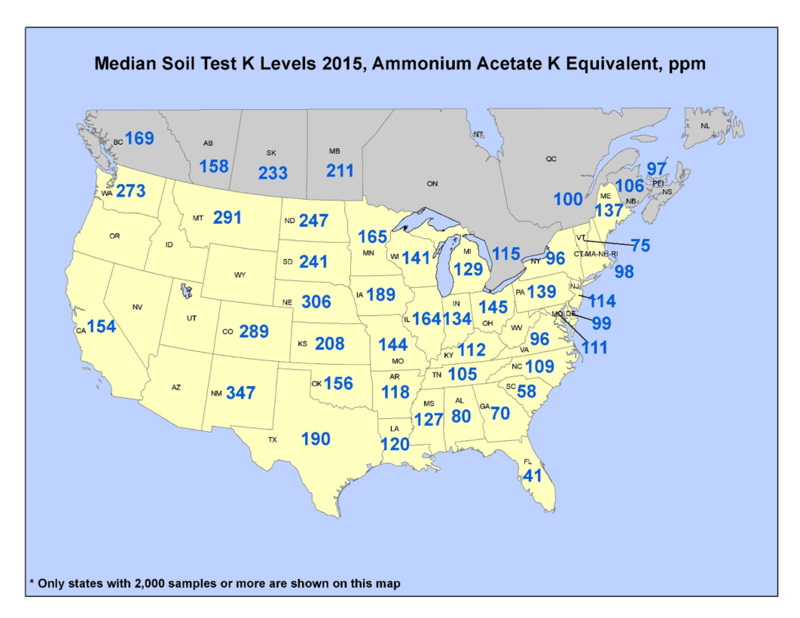 The most recent analysis in 2015 showed median soil test K levels in Alberta was 158 (down from 173 ppm in 2010), Saskatchewan at 233 ppm (static with 2010 levels) and Manitoba at 211 ppm (again static with 2010 levels. Based on research and the relatively high cation exchange capacity (CEC) of Prairie soils, 160 ppm is considered approximately the critical level where crops (especially cereals) are responsive to potash applications. These results indicate that soils in Alberta are much more liable to react to a potash application than either Saskatchewan or Manitoba. The drop-in soil test K levels also indicates a possible shortfall in K applications to crops in Alberta. Silage crops, fields where straw has been removed and Forage fields are most likely to show a reduction in K levels. Always confirm suspected K deficiencies with soil and tissue analysis. The Right Place for Potassium will be determined by what your soil potassium levels are. For most efficient use by cereal crops, K fertilizer should be placed with the seed. For most row crops, potash should be side-banded to the side and/or below the seed. 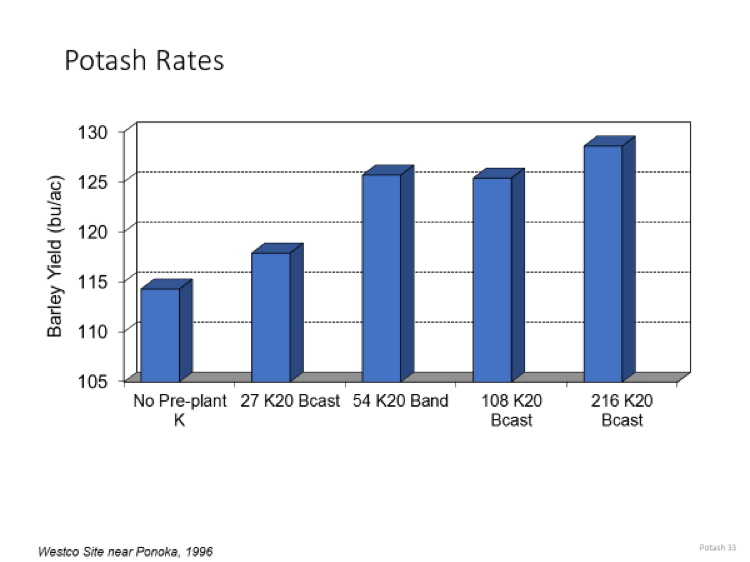 The efficiency of broadcast and incorporated potash is about 50% that of potash banded with the seed or side-banded. However, in deficient soil, a seedplaced or side banded application might be combined with a broadcast application to get the desired rates applied. If all your potash is broadcast, the recommended rate for seed placement or side banding should be doubled to obtain equal crop response. Broadcast K fertilizer should also be incorporated into the soil. And finally, the Right Time for Potassium fertilizers will also depend on your soil levels. As previously stated, the most efficient use by cereal crops, K fertilizer when seedplaced or side banded at seeding. Broadcast applications can be made in the fall or spring prior to seeding. For forage crops, potassium is usually applied at rates equivalent to the anticipated removal for the first 2-3 years. Annual applications can then be applied in following years. These applications may or may not result in a crop response so a strip trial in crop of 50 – 100 lbs K2O per acre can be made to see if there is a response following the second year of hay removal. Depending on your soil and rainfall, this application may prove beneficial. Stay tuned for the next part of this series where I’ll tackle Sulphur. © 2005 - 2019 Farmers Edge Inc. All rights reserved. Rob Sharkey can’t remember the exact moment he knew he wanted to be a farmer, because he can’t remember a time when he didn’t. Growing up on his family’s hog farm outside of Bradford, Illinois, he knew he’d leave for college, but he also knew he’d be back – and that’s exactly what he did. After graduating with a degree from Southern Illinois University in Agribusiness Economics, he happily headed back to his roots, married his high-school sweetheart Emily and was hopeful for a future doing all he’d ever known in the only place he’d ever called home. Two years later he found himself in the best of times, expanding the family operation through buying his own hogs, then almost as quickly he found himself in the worst of times, with the hog market crash of 1998, and along with it, the crashing of his dreams. Rob says that year was the most pivotal one in his life. Yet as hard as it was to endure, enduring it is exactly what gave him the fortitude to excel in all that’s happened since. With a young family to support, quitting wasn’t an option, even though things didn’t look at all like he thought they would. The year after the crash he decided to diversify his farm by starting a whitetail deer outfitter service. The following year, while still helping his father farm corn and soybeans, he was able to rent his own ground and expand their farming operation. In addition, Rob and his wife Emily took the opportunity to manage a buying co-op, a job Rob says he was grateful for, but that his heart was never really in. As he continued to farm with his father, all responsibilities and full-time farm ownership eventually became his when his dad retired in 2008, giving Rob the chance to buy out his dad, and simultaneously give up his co-op job. Fast-forward six years, after the loss of his father and working hard to keep the farm profitable, Rob felt a desire to do something different, in addition to farming and outfitting. Having watched his friend Carrie Zylka’s success with her hunting podcast, he thought it would be interesting to start his own. Using his handle from twitter, the “SharkFarmer” podcast was born. When he began, he thought he would only be sharing hunting stories, but quickly realized they weren’t as exciting for a broad audience to listen to as they were to hear amongst fellow hunters. Instead, he changed direction and his podcast became a platform for farmers (and since then, non-farmers) to share life stories of strength and struggles, overcoming adversities, and in turn, a common ground for people of all backgrounds to tune in and be encouraged and inspired week in and week out. In 2017, one of his podcast advertising partners introduced him to the young Canadian agronomy company Farmers Edge and he was impressed with what he saw. He soon began using their products and has since become a spokesperson for them. He says, “When I first started using Farmers Edge, they challenged the way I looked at farming. Before using FarmCommand, I wasn’t implementing the technology side of my farm into the agronomic side. I had maps, but I wasn’t utilizing them. Now, through the accuracy of their variable rate prescriptions, I’m making more money.” He also appreciates the high quality of service he gets from their reps and the fact they make his job easier. While opportunities continue to soar for Rob, he says he plans to retire eventually. In the meantime, he’s building his farming, outfitting and media operations that his four children will have solid choices to continue in, if they choose. If they don’t, he says he’s fine with that too. Never having felt pressured to come back to the farm, he wants his children to have the same freedom to pursue their own dreams. 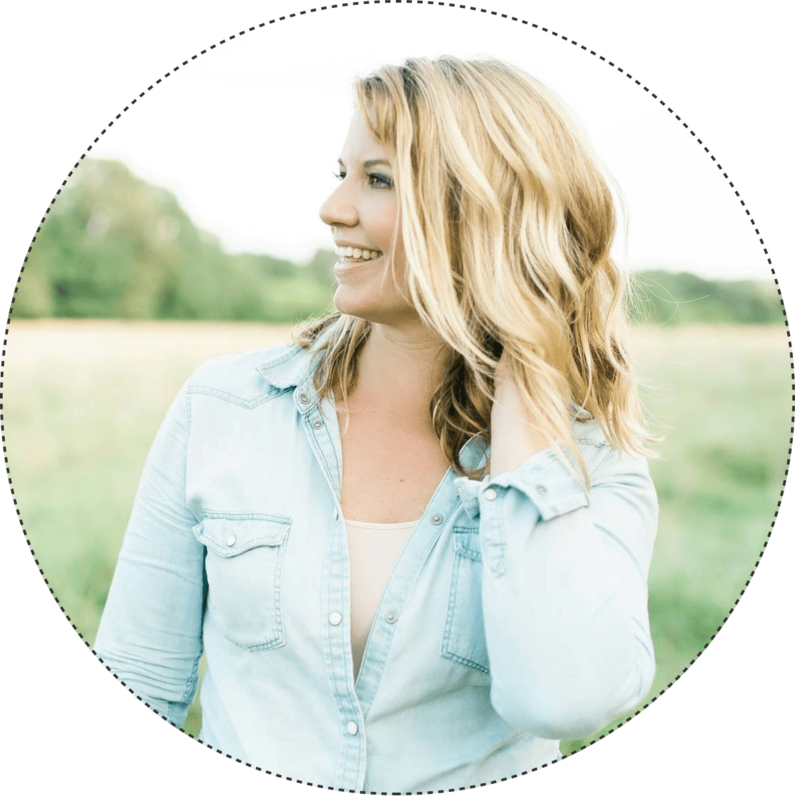 Meredith Bernard is a mom to two, photographer, writer and farmer living and working alongside her husband on a beef cattle farm in Milton, NC. Connect with her online at thisfarmwife.com. 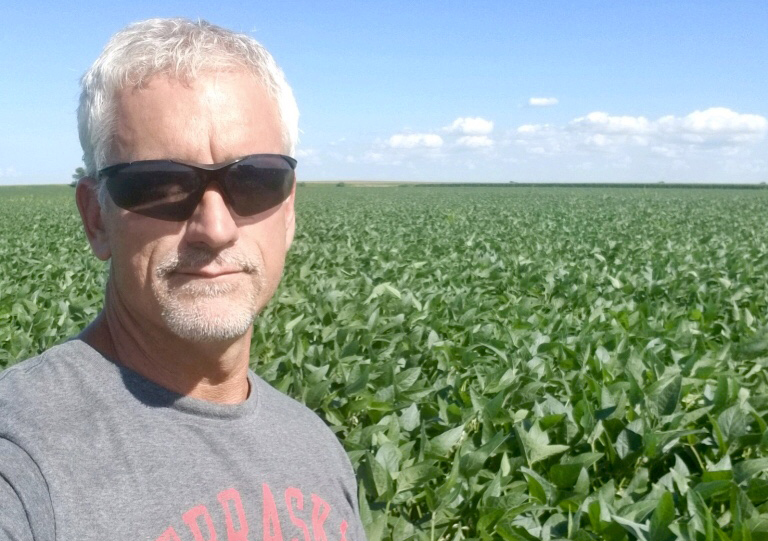 During the mid-1980’s when many farmers were finding it hard to hang on, Nebraska native Randy Uhrmacher decided at the age of 18 that it was just the right time for him to dig in and make a go of it. As a fourth-generation farm kid, he knew he wanted to continue the legacy his family had started and when the opportunity to rent more land became available right out of high school, he seized it. Times were hard and the struggle was real, but so was Randy’s drive to make it work and that’s exactly what he’s done. Change has never been a hindrance for the Uhrmacher farm, instead, it’s been a catalyst for growth. From what began as a multi-faceted operation with cattle, hogs and crops, today is a 4000-acre enterprise of solely corn and soybeans that Randy farms alongside with his brother and his son, Derek. When pressed as to why he thinks he’s been so successful, he attributes the lessons he learned through such a hard start and not being afraid to try new things along the way. Randy isn’t different from a lot of other farmers in working the crops he grows, but he has had some different approaches to making his crops work better for him. With three-quarters of the land he farms being irrigated and the rest dry land, having a grasp on all agronomic aspects and moisture management are essential for raising and harvesting profitable crops. Three years ago, Randy began hearing about a relatively new agronomy player in the field and he was intrigued enough to test the value he perceived they could bring. After having Farmers Edge on board with their operation for two full years now, Randy says they have brought value to the table since day one and it continues to grow and improve. The Farmers Edge all-in-one approach combining Daily Satellite Imagery, on-farm weather stations, and variable rate mapping to their farm zones has made farming not only easier for Randy and his partners, but also more profitable and in the end that’s where the true value lies. 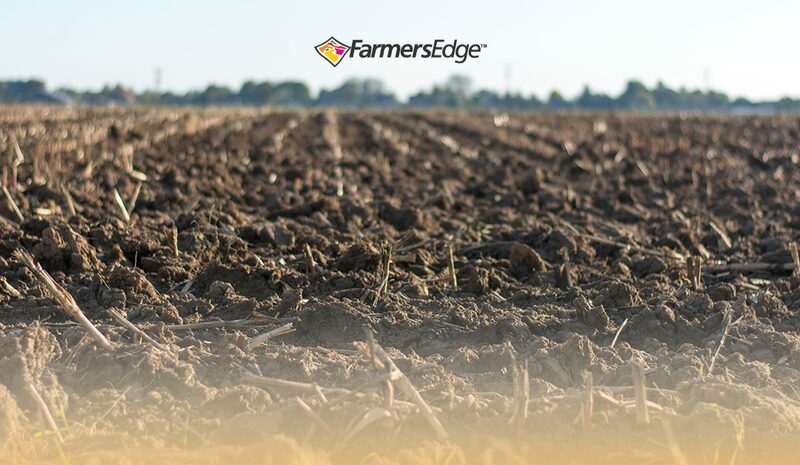 For someone who isn’t afraid to farm “different” when different means better, Randy is excited to try Farmers Edge new Soil Moisture Monitoring Service this growing season. Through what he saw using their test soil moisture probes last year, he’s ready to unleash this new technology across all their fields this year. Across the board, from the complete data collected through FarmCommand, timely and friendly service from field reps, to state of the art moisture management tools that nobody else in the industry is offering, Randy sees his decision to join the Farmers Edge team of growers as a win-win. Randy considers himself somewhere in the top third of farmers for being an early adopter to using new technology. He learned early on that by watching “pioneers” in farming who would try new things, he could learn from their successes and try to perfect their failures. That mindset and practice has gotten him through hard times and allowed his farm to continue to thrive. He has benefited from using Farmers Edge products the past few years and looks forward to continuing to benefit from the new and different ideas they keep bringing to the table. Different may be different, but it can also very much be forward. If there is one word that sums up farmer Derek Klingenberg, it would be “different.” When his grandpa migrated from Prussia in 1923 and settled down on a farm north of Wichita, Kansas, chances are good he had no idea the changes the farm would see or how his grandson would use his talents and out-of-the-box ideas to bring a well-rooted love of farming to a different stage. 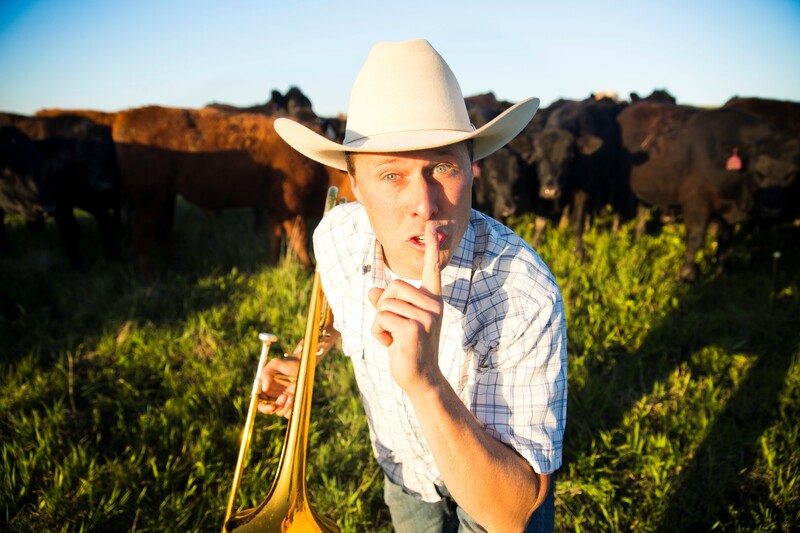 From an early age, Derek was ingrained in not only the day-to-day of helping farm crops and background cattle, but he was also heavily involved in music, including singing in groups, marching band, and playing several musical instruments. After graduating from Kansas State University with degrees in Ag Economics and Agronomy tucked under his belt, he married and found himself back on the family farm raising a family of his own in addition to raising cows, wheat, corn and soybeans. But, his love for music and entertaining was never far from his mind and he eventually found ways to combine his love for both. Out of all the Farmers Edge tools Derek has at his disposal, he says his favorite is their daily satellite imagery which is processed into multiple map layers to monitor crop health and variability. In addition to the information it provides on where to most adequately apply fertilizer (which is done remotely and sent as a prescription to his local co-op), he’s also learned how to judge the time when the satellite is flying over his farm and used that to his advantage to video his cows eating in the formation of images and words like “Hi,” a heart, smiley face and a cow pi. 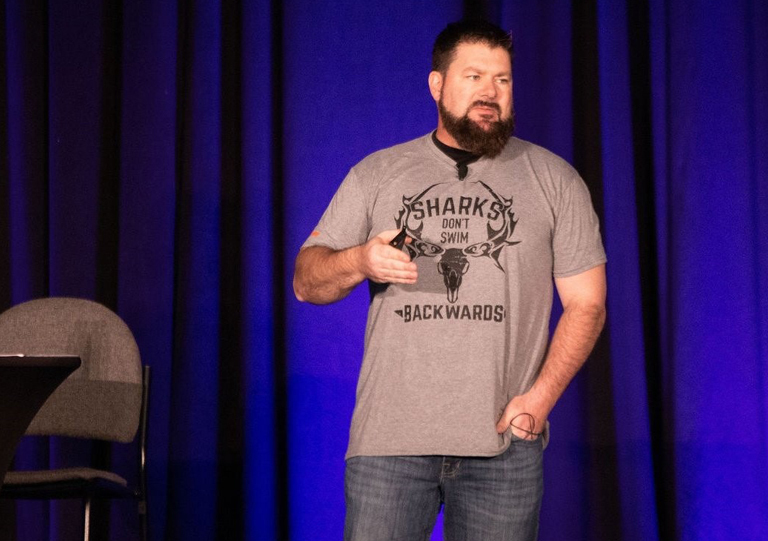 A self-professed “farm nerd,” Derek has found amazing ways to merge his own version of different with the differences Farmers Edge offers, to make a really big difference.